Saint Arnold Brewing Company is just north of downtown on Lyons Ave. 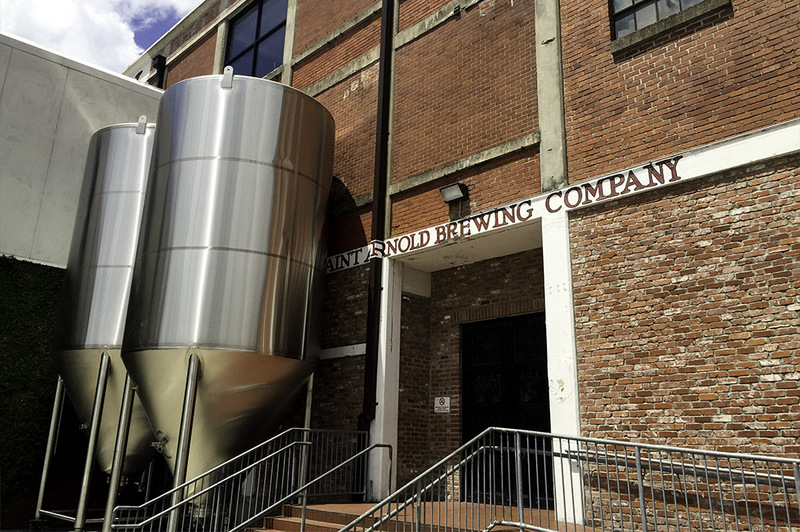 The brewery moved to this location in 2010 after it grew too big for its original spot off the Northwest Freeway. One of the most successful craft breweries in the Houston area, Saint Arnold beer can be found throughout Texas and Louisiana. The brand has now made its way to Florida and I have no doubt it will soon be a favorite there as well. 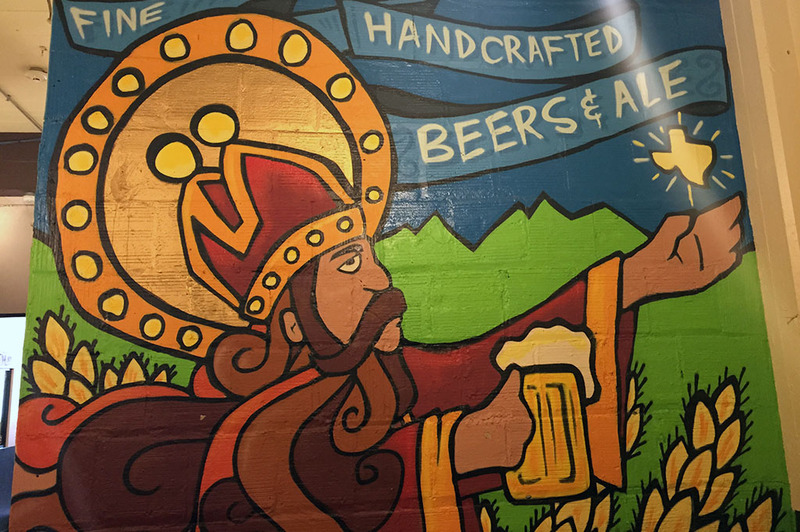 Saint Arnold Brewing Company is named after a patron saint of brewing, Saint Arnulf of Metz. You get the feel for this theme as soon as you walk through the doors and take in all the beautiful artwork showcasing the Saint Arnold logo throughout the premises. 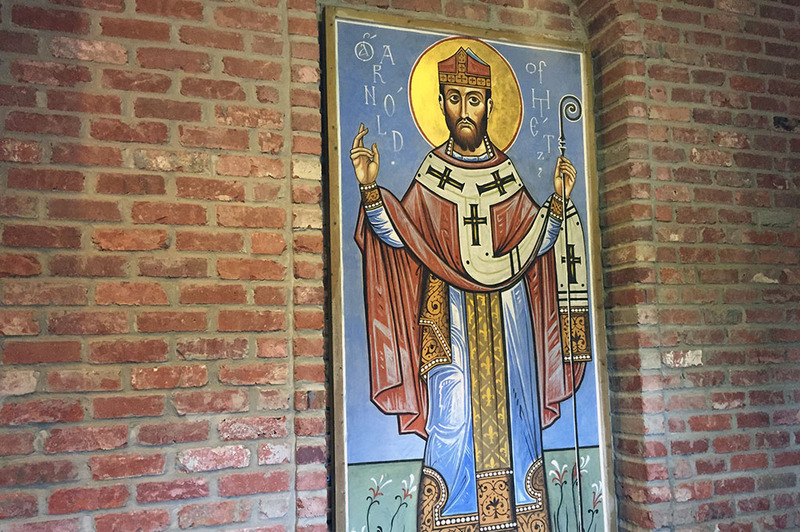 As you can see in the photography, the brewery is truly fit for a Saint! We had a chance to visit Saint Arnold’s on “Craft Beer Friday”, and I must say the experience certainly lived up to its reputation as you get a true brewery experience at the highest level. 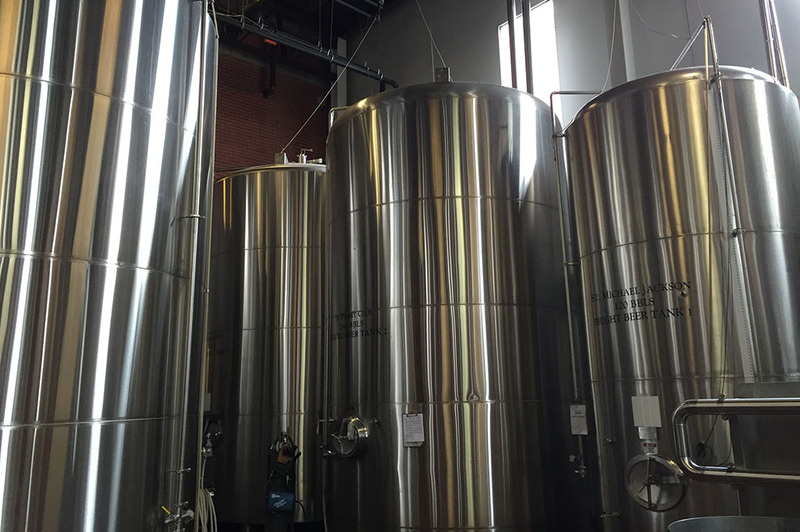 Most craft breweries are more intimate and have much smaller facilities. But, these guys have Houston locked down in this ginormous, 104,000 square foot, brick gem. I can see why people travel from all over the country to visit. They also serve food which is a big plus and let me tell ya, the food is good! We felt like kings as we sat down at the long wooden tables to enjoy our lunch and craft beers. We were perfectly at home amongst the 200 or so new friends who were also celebrating “Craft Beer Friday” at Saint Arnold’s on this lovely summer day in Houston. 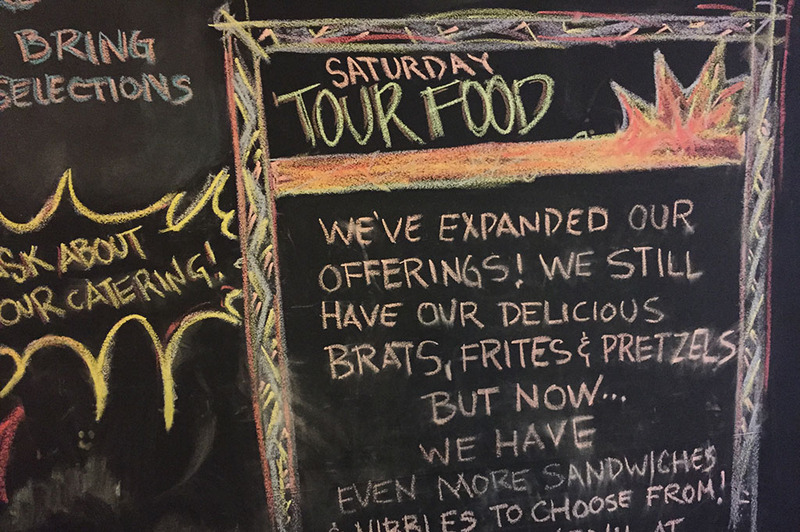 Saint Arnold Brewing Company just recently changed their menu and now offer an extensive variety of good eats! We had the pleasure of enjoying the Prime Rib French Dip, Bacon Cheddar Burger and Thai Wonton Salad. 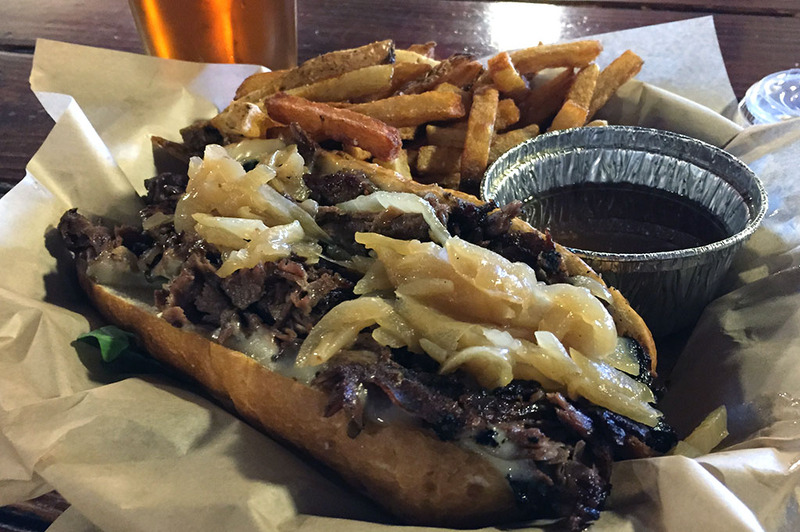 The Prime Rib French Dip consisted of mouthwateringly delicious, slow-cooked sliced rib-eye topped with caramelized onions, and Provolone – which was then drizzled with jus and served on a pretzel roll. This sandwich was my favorite; the sliced rib-eye was fabulous, but the caramelized onions and pretzel roll are what really took this sandwich to another level. I also recommend the Bacon Cheddar Burger and the Thai Wonton Salad as both came in at a close second. 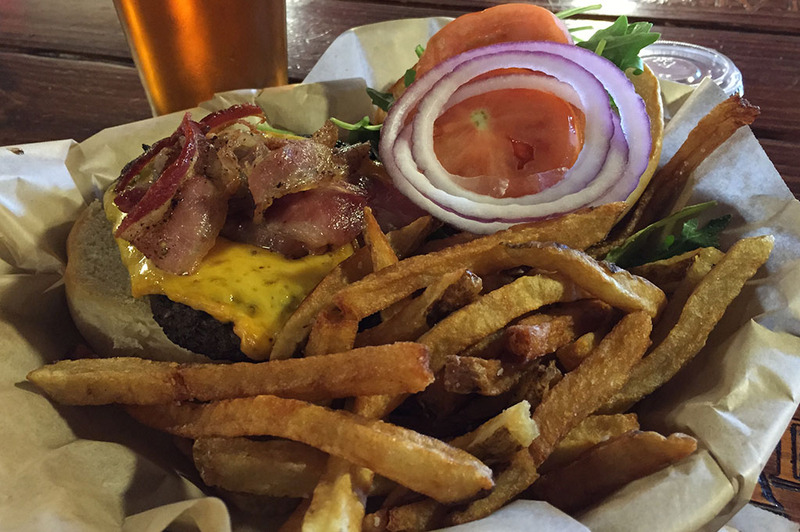 The Bacon Cheddar Burger was made up of a large, ½ lb beef patty with arugula, tomato and red onion served on a toasted challah bun. The meat was cooked to perfection and the bacon atop the melted cheddar was excellent. 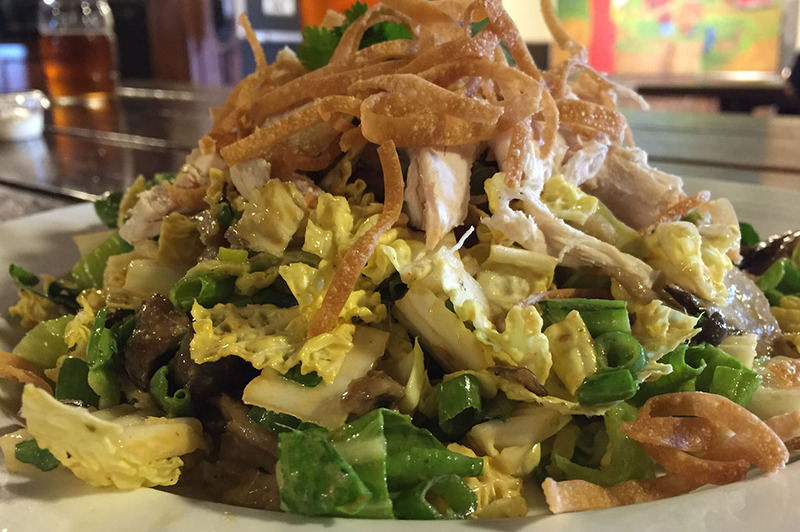 The Thai Wonton Salad was a delightful medley of bok choy, napa cabbage, crispy wonton, and mushrooms – the perfect choice if you want something light so you can save more room for the wonderfully filling Saint Arnold craft beer that just keeps flowing. After lunch, we headed off for a tour of the brewery. Everyone was hard at work with huge smiles on their faces. What a friendly bunch, but I guess you would be too if you were a part of something so beautiful. 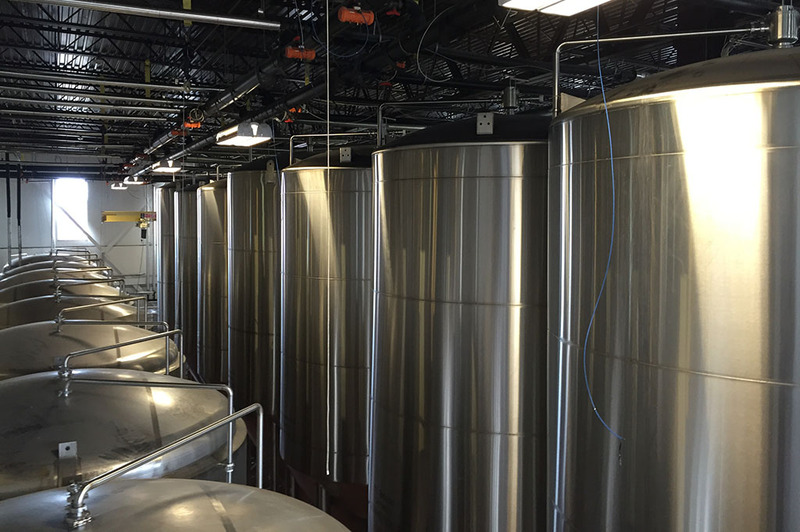 All the tanks are named after Saints – some are real and some are just made up. The tour is extremely informative and extensive as you get to go through the entire beer-making process from start to finish, all the way up to bottling, with great attention to detail. Tours run from Monday to Saturday and include a souvenir glass. If you had to pick just one Houston brewery to visit, Saint Arnold Brewing Company would be my suggestion. 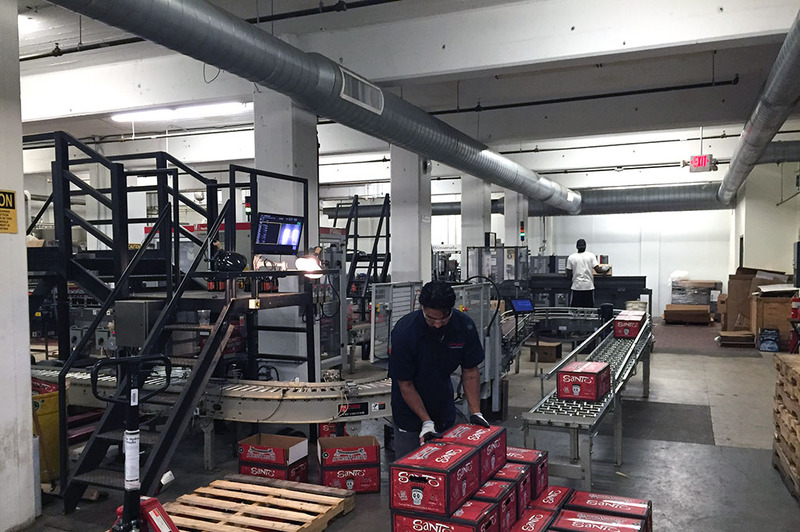 The popularity of craft beer is growing fast in Houston. 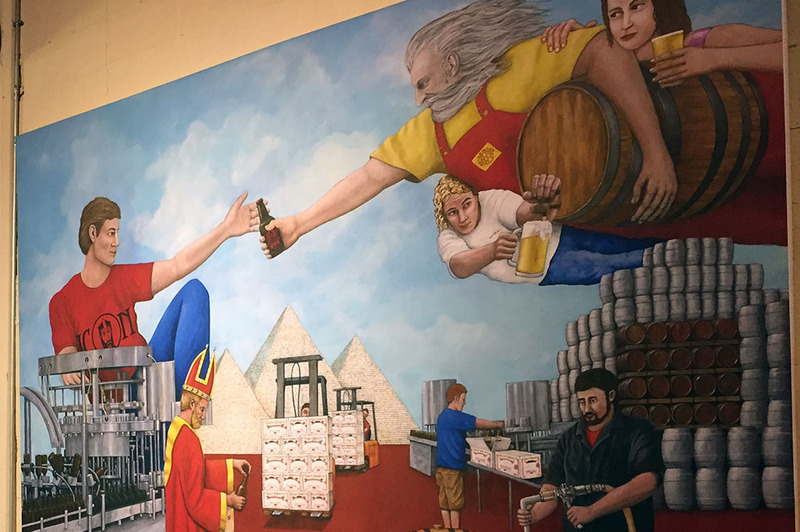 Saint Arnold Brewing Company has been a pioneer in perfecting the process and is definitely in a league of its own. 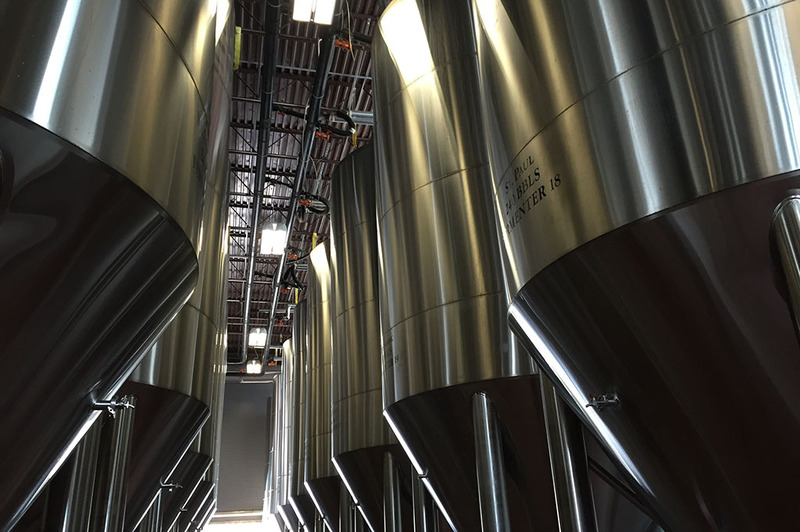 At Saint Arnold’s, you get more than just great beer… you get a true brewery experience that lasts all day! Boiler Room is a light bodied but surprisingly flavorful sour wheat beer. The sourness is created by souring the wort prior to boiling and fermentation (unlike Belgian-style sours which sour during fermentation and have active bacteria in them when packaged). The nose of the beer has a light Hersbrucker hop note and a distinct funkiness. The taste is sweet malt quickly going into a tart body and finish. The sour and malt flavors balance well all the way through creating a very refreshing beverage, akin to drinking a tart lemonade or limeade. For a beer with just over 3.5%, it creates a big experience for the palate. Traditionally this beer is enjoyed either straight or with raspberry or woodruff syrup to sweeten it (and turn it red or green, respectively). A true bohemian-style pilsner. Crisp and refreshing, this beer is perfect for a hot summer day. Saint Arnold Summer Pils has a delicate, sweet malt taste complemented by an abundant hop aroma and flavor. This beer is brewed with fine German malt, and a copious quantity of “noble” hops imported from the Czech Republic. Saint Arnold Summer Pils is best consumed at 36° Fahrenheit. Recommended pairings: Spicy Mexican, pizza, & lamb kebabs. A traditional India Pale Ale, the Elissa IPA is very hoppy with a properly balanced malty body. Elissa has huge hop additions in the kettle that give it a wonderful bitterness and is then dry-hopped in the fermenter to create the pleasant floral, hoppy nose. Our reverse osmosis water makes the bitter very soft with no harsh notes to it. The maltiness is derived from British Maris Otter malt. Its rich flavor stands up to the hops that would otherwise dominate this beer. The Elissa is an authentic version of an India Pale Ale (IPA) style. Recommended pairings: Any style of seafood, Indian food, & spicy Thai.